This article is about flight simulation in general, but focuses mainly on professional devices. For lower-end, non-professional or recreational simulators, see Amateur flight simulation. For the Microsoft product, see Microsoft Flight Simulator. For all other uses, see Flight simulator (disambiguation). In 1910, on the initiative of the French commanders Clolus and Laffont and Lieutenant Clavenad, the first ground training aircraft for military aircraft were built. The "Tonneau Antoinette" (Antoinette barrel), created by the Antoinette company, seems to be the precursor of flight simulators. The best-known early flight simulation device was the Link Trainer, produced by Edwin Link in Binghamton, New York, USA, which he started building in 1927. He later patented his design, which was first available for sale in 1929. The Link Trainer was a basic metal frame flight simulator usually painted in its well-known blue color. Some of these early war era flight simulators still exist, but it is becoming increasingly difficult to find working examples. The Link family firm in Binghamton manufactured player pianos and organs, and Ed Link was therefore familiar with such components as leather bellows and reed switches. 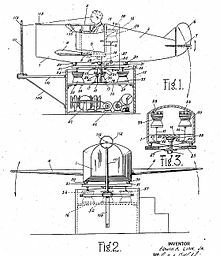 He was also a pilot, but dissatisfied with the amount of real flight training that was available, he decided to build a ground-based device to provide such training without the restrictions of weather and the availability of aircraft and flight instructors. His design had a pneumatic motion platform driven by inflatable bellows which provided pitch and roll cues. A vacuum motor similar to those used in player pianos rotated the platform, providing yaw cues. A generic replica cockpit with working instruments was mounted on the motion platform. When the cockpit was covered, pilots could practice flying by instruments in a safe environment. The motion platform gave the pilot cues as to real angular motion in pitch (nose up and down), roll (wing up or down) and yaw (nose left and right). Initially, aviation flight schools showed little interest in the "Link Trainer". Link also demonstrated his trainer to the U.S. Army Air Force (USAAF), but with no result. 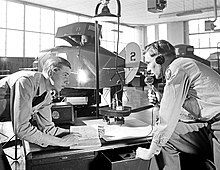 However, the situation changed in 1934 when the Army Air Force was given a government contract to fly the postal mail. This included having to fly in bad weather as well as good, for which the USAAF had not previously carried out much training. During the first weeks of the mail service, nearly a dozen Army pilots were killed. The Army Air Force hierarchy remembered Ed Link and his trainer. Link flew in to meet them at Newark Field in New Jersey, and they were impressed by his ability to arrive on a day with poor visibility, due to practice on his training device. The result was that the USAAF purchased six Link Trainers, and this can be said to mark the start of the world flight simulation industry. The principal pilot trainer used during World War II was the Link Trainer. Some 10,000 were produced to train 500,000 new pilots from allied nations, many in the US and Canada because many pilots were trained in those countries before returning to Europe or the Pacific to fly combat missions. Almost all US Army Air Force pilots were trained in a Link Trainer. A different type of World War II trainer was used for navigating at night by the stars. The Celestial Navigation Trainer of 1941 was 13.7 m (45 ft) high and capable of accommodating the navigation team of a bomber crew. It enabled sextants to be used for taking "star shots" from a projected display of the night sky. In 1954 United Airlines bought four flight simulators at a cost of $3 million from Curtiss-Wright that were similar to the earlier models, with the addition of visuals, sound and movement. This was the first of today's modern flight simulators for commercial aircraft. The simulator manufacturers are consolidating and integrate vertically as training offers double-digit growth: CAE forecast 255,000 new airline pilots from 2017 to 2027 (70 a day), and 180,000 first officers evolving to captains. The largest manufacturer is Canadian CAE Inc. with a 70% market share and $2.8 billion annual revenues, manufacturing training devices for 70 years but moved into training in 2000 with multiple acquisitions. Now CAE makes more from training than from producing the simulators. Crawley-based L3 CTS entered the market in 2012 by acquiring Thales Training & Simulation's manufacturing plant near Gatwick Airport where it assembles up to 30 devices a year, then UK CTC training school in 2015, Aerosim in Sanford, Florida in 2016, and Portuguese academy G Air in October 2017. With a 20% market share, equipment still accounts for more than half of L3 CTS turnover but that could soon be reversed as it educates 1,600 commercial pilots each year, 7% of the 22,000 entering the profession annually, and aims for 10% in a fragmented market. The third largest is TRU Simulation + Training, created in 2014 when parent Textron Aviation merged its simulators with Mechtronix, OPINICUS and ProFlight, focusing on simulators and developing the first full-flight simulators for the 737 MAX and the 777X. The fourth is FlightSafety International, focused on general, business and regional aircraft. Airbus and Boeing have invested in their own training centres, aiming for higher margins than aircraft manufacturing like MRO, competing with their suppliers CAE and L3. In June 2018 there were 1,270 commercial airline simulators in service, up by 50 over a year: 85% FFSs and 15% FTDs. CAE supplied 56% of this installed base, L3 CTS 20% and FlightSafety International 10%, while CAE's training centres are the largest operator with a 13% share. North America has 38% of the world's training devices, Asia-Pacific 25% and Europe 24%. Boeing types represent 45% of all simulated aircraft, followed by Airbus with 35%, then Embraer at 7%, Bombardier at 6% and ATR at 3%. Cockpit of a twinjet flight simulator. Several different devices are utilized in modern flight training. Cockpit Procedures Trainer (CPT) are used to practice basic cockpit procedures, such as processing emergency checklists, and for cockpit familiarization. Certain aircraft systems may or may not be simulated. The aerodynamic model is usually extremely generic if present at all. Statistically significant assessments of skill transfer based on training on a simulator and leading to handling an actual aircraft are difficult to make, particularly where motion cues are concerned. Large samples of pilot opinion are required and many subjective opinions tend to be aired, particularly by pilots not used to making objective assessments and responding to a structured test schedule. For many years, it was believed that 6 DOF motion-based simulation gave the pilot closer fidelity to flight control operations and aircraft responses to control inputs and external forces and gave a better training outcome for students than non-motion-based simulation. This is described as "handling fidelity", which can be assessed by test flight standards such as the numerical Cooper-Harper rating scale for handling qualities. Recent scientific studies have shown that the use of technology such as vibration or dynamic seats within flight simulators can be equally effective in the delivery of training as large and expensive 6-DOF FFS devices. Before September 2018  when a manufacturer wished to have an ATD model approved, a document that contains the specifications for the model line and that proves compliance with the appropriate regulations is submitted to the FAA. Once this document, called a Qualification Approval Guide (QAG), has been approved, all future devices conforming to the QAG are automatically approved and individual evaluation is neither required nor available. The actual procedure accepted by all CAAs (Civil Aviation Authorities) around the world is to propose 30 days prior qualification date (40 days for CAAC) a MQTG document (Master Qualification Test Guide), which is proper to a unique simulator device and will live along the device itself, containing objective, and functional and subjective tests to demonstrate the representativeness of the simulator compare to the airplane. The results will be compared to Flight Test Data provided by aircraft OEMs or from test campaign ordered by simulator OEMs or also can be compared by POM (Proof Of Match)data provided by aircraft OEMs development simulators. Some of the QTGs will be rerun during the year to prove during continuous qualification that the simulator is still in the tolerances approved by the CAA. FAA Basic ATD (BATD) - Provides an adequate training platform and design for both procedural and operational performance tasks specific to the ground and flight training requirements for Private Pilot Certificate and instrument rating per Title 14 of the Code of Federal Regulations. FAA Advanced ATD (AATD) - Provides an adequate training platform for both procedural and operational performance tasks specific to the ground and flight training requirements for Private Pilot Certificate, instrument rating, Commercial Pilot Certificate, and Airline Transport Pilot (ATP) Certificate, and Flight Instructor Certificate. FAA FTD Level 4 - Similar to a Cockpit Procedures Trainer (CPT). This level does not require an aerodynamic model, but accurate systems modeling is required. FAA FTD Level 5 - Aerodynamic programming and systems modeling is required, but it may represent a family of aircraft rather than only one specific model. FAA FTD Level 6 - Aircraft-model-specific aerodynamic programming, control feel, and physical cockpit are required. FAA FTD Level 7 - Model specific, helicopter only. All applicable aerodynamics, flight controls, and systems must be modeled. A vibration system must be supplied. This is the first level to require a visual system. FAA FFS Level A - A motion system is required with at least three degrees of freedom. Airplanes only. FAA FFS Level B - Requires three axis motion and a higher-fidelity aerodynamic model than does Level A. The lowest level of helicopter flight simulator. FAA FFS Level C - Requires a motion platform with all six degrees of freedom. Also lower transport delay (latency) over levels A & B. The visual system must have an outside-world horizontal field of view of at least 75 degrees for each pilot. FAA FFS Level D - The highest level of FFS qualification currently available. Requirements are for Level C with additions. The motion platform must have all six degrees of freedom, and the visual system must have an outside-world horizontal field of view of at least 150 degrees, with a Collimated (distant focus) display. Realistic sounds in the cockpit are required, as well as a number of special motion and visual effects. MCC - Not a true "level" of qualification, but an add-on that allows any level of FNPT to be used for Multi Crew Coordination training. EASA FTD Level 3 - Helicopter only. The largest flight simulator in the world is the Vertical Motion Simulator (VMS) at NASA Ames Research Center, south of San Francisco. This has a very large-throw motion system with 60 feet (+/- 30 ft) of vertical movement (heave). The heave system supports a horizontal beam on which are mounted 40 ft rails, allowing lateral movement of a simulator cab of +/- 20 feet. A conventional 6-degree of freedom hexapod platform is mounted on the 40 ft beam, and an interchangeable cabin is mounted on the platform. This design permits quick switching of different aircraft cabins. Simulations have ranged from blimps, commercial and military aircraft to the Space Shuttle. In the case of the Space Shuttle, the large Vertical Motion Simulator was used to investigate a longitudinal pilot-induced oscillation (PIO) that occurred on an early Shuttle flight just before landing. After identification of the problem on the VMS, it was used to try different longitudinal control algorithms and recommend the best for use in the Shuttle program. AMST Systemtechnik GmbH (AMST) of Austria and Environmental Tectonics Corporation (ETC) of Philadelphia, US, manufacture a range of simulators for disorientation training, that have full freedom in yaw. The most complex of these devices is the Desdemona simulator at the TNO Research Institute in The Netherlands, manufactured by AMST. This large simulator has a gimballed cockpit mounted on a framework which adds vertical motion. The framework is mounted on rails attached to a rotating platform. The rails allow the simulator cab to be positioned at different radii from the centre of rotation and this gives a sustained G capability up to about 3.5. ^ Federal Aviation Administration (25 April 2013). "FAR 121 Subpart N—Training Program". Retrieved 28 April 2013. ^ "Dry Shooting for Airplane Gunners." Popular Science Monthly, January 1919, pp. 13–14. ^ Fly Away Simulation (12 July 2010). "Flight Simulator Technology Through the Years". Archived from the original on 12 October 2011. Retrieved 20 April 2011. ^ a b c d "ASME Landmarks: The Link Flight Trainer." Archived 17 December 2011 at the Wayback Machine American Society of Mechanical Engineers. Retrieved: 18 December 2011. ^ "U.S. Air Force Fact Sheet: Link Trainer." National Museum of the United States Air Force. Retrieved: 12 October 2016. ^ "Airline Pilots Fly Anywhere in the world - Without Leaving the Ground." Popular Mechanics, August 1954, p. 87. ^ a b Murdo Morrison (25 June 2018). "Civil simulator manufacturer strategies compared". FlightGlobal. ^ Antoine Fafard (26 June 2018). "Analysis: Civil simulator fleet nears 1,300 mark". FlightGlobal. ^ "Navy CPT". www.navair.navy.mil. U.S. Navy. Retrieved 4 August 2014. ^ Andrea L. Sparko; Judith Bürki-Cohen; Tiauw H. Go (2010). Transfer of Training from a Full-Flight Simulator vs. a High Level Flight Training Device with a Dynamic Seat. AIAA Modeling and Simulation Technologies Conference. doi:10.2514/6.2010-8218. Retrieved 18 September 2016. ^ Peter John Davison. "A summary of studies conducted on the effect of motion in flight simulator pilot training" (PDF). MPL Simulator Solutions. Retrieved 18 September 2016. ^ Beard, Steven; et al. "Space Shuttle Landing and Rollout Training at the Vertical Motion Simulator" (PDF). AIAA. Retrieved 5 February 2014. ^ "DESDEMONA: The next generation in movement simulation" Nederlandse Organisatie voor Toegepast Natuurwetenschappelijk Onderzoek Retrieved: 5 July 2012. ^ Roza, M., M. Wentink and Ph. Feenstra. "Performance Testing of the Desdemona Motion System." AIAA MST, Hilton Head, South Carolina, 20–23 August 2007. Kelly, Lloyd L. as told to Robert B. Parke. The Pilot Maker. New York: Grosset & Dunlap, 1979, First edition 1970. ISBN 0-448-02226-5. Wikimedia Commons has media related to Flight simulators.